Our Custom Mystery Number Tricks are fun and easy to perform. With the Great Number Mystery Magic Trick, the Magician hands the seven cards in the trick to a spectator. Then, the Magician asks the person to return each Number Mystery card to them on which the spectator’s age appears. And the spectator is asked not to tell the Magician what their age is. The Magician then never fails to guess the correct age of the spectator! The secret to our Custom Number Mystery trick is that the Magician simply adds the number in the upper left hand corner of the card that the person gives back to you. 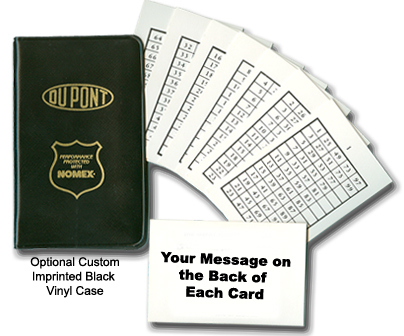 Custom Imprinted Number Mystery Tricks come packaged in either an economical heat-sealed cello-bag or in black vinyl card case.